ARE you helplessly looking at your plants, being damaged by various pests and diseases? According to natures time table when the new growth of plants starts, insects too appear. Here are a few tips on how to keep them at bay. But first, a few other considerations. For the best results from your garden, adopt a scientific approach. Gardening experts have remedies for your gardening problems. So, keep in touch with the experts. Most of the queries that we receive these days relate to ladies finger. The leaves turn yellow and fruiting is reduced. This could be because you have unknowingly procured virus resistant seeds. Pusa Padmini, a recommended cultivar of Punjab Agricultural University, is tolerant to yellow mosaic virus. Only a few virus symptoms appear on a new shoots, that too quite late in the season. Another variety, Punjab-7, has a high degree of resistance to this virus. Similarly in case of chilli, Punjab Surkh is moderately resistant to mosaic virus while Punjab Guchhedar is highly resistant to mosaic and tolerant to leaf curl virus. Similarly CH-I is tolerant to virus and fungal diseases, Punjab Lal is resistant to viruses and moderately resistant to fruit rot and die back diseases. Another problem with ladies finger and brinjal is the curling upwards (cupping) of leaves caused by jassids. Spraying malathion, sevin endosulfan etc will help. These chemicals will also take care of the white fly that acts as a vector (carrier) of virus and spotted boll-worm in ladies finger and badda beetle. Remember, once a plant has been affected by virus you cannot correct the fault. You have to uproot the plant to destroy the virus. Many times it happens that you pay through your nose to get good quality seed from some good company. The problem in such cases , however, is that the seed has not been tested in a particular region and as a result you get table tennis ball-sized stiff brinjals or one inch long ladies finger which turn yellow or varieties prone to disease and insects. Hence it is important to get seed from a reliable source. In case of a citrus, the lemon butterfly which is a beautiful greenish black insect with yellow spots, causes considerable damage when its larvae devour the leaves. 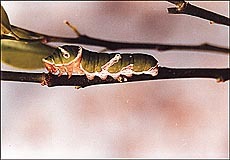 The larva grows into an inch long caterpillar. If you want to be sure that it is the same insect, just touch it with a small twig on its head and it will throw out two red extensions to scare you away. If you do not move away then it will give out an offensive odour. Another problem you may face is of fully ripe guava severely infested with maggots or fruit-fly. The fruit-fly attacks fruits like guava when they start ripening and the skin starts softening.The female lays eggs, puncturing the skin. The maggots move-in and attack fruit from within. The fruit drops on the ground and the larvae move underground. They reappear with the first monsoon shower as adults at a time when the fruit begins to ripen. The fruit of the monsoon season is generally unfit for consumption. The second crop, that is the winter season crop, is not only free from the fruit-fly but is also superior to the summer season crop. In order to get only the winter season crop, irrigation is withheld during April-May. The tree can also be sprayed with 10 per cent urea during May. Fertiliser is given in June to encourage growth in July-August and get maximum flowering during August-September.